I love the drama, the upsets, the storylines, the raw emotion you see when these college players win (and lose) games. I wanted to do something basketball themed for the blog, but I didn't necessarily want to make basketball-shaped food items. Last night, I was falling asleep thinking of things to make with Yukon Gold potatoes (isn't that what everyone thinks about when they're falling asleep?) Suddenly "Triple Threat" popped into my head. In basketball, a triple threat is when a player receives the ball but hasn't dribbled yet. From there, he can either dribble, pass, or shoot. Hence...triple threat. But in this case, the triple threat is a potato made three ways: Baked, Mashed, and Fried. I received some Yukon Gold potatoes in my CSA veggie bag. Since I didn't really have a choice in what sizes I received, I used the two big ones to make the hash browns, the medium-sized ones to make the potato skins, and the little ones for extra filler for the mashed potatoes. Wash and dry the potatoes, and separate the ones for shredding from the others. Drizzle the others with oil and bake for 35-40 minutes or until easily pierced with a fork. Since they were smaller than a typical twice-baked potato, I decided to keep the potatoes mostly whole. To do this, I sliced off just the top portion of the potatoes. (Alternately, you could slice them in half to make twice as many potato skins). If the potatoes are really bumpy and won't sit upright on their own, shave a small piece off the bottom as well so they sit flat. Then scoop out most of the potato flesh, leaving a thin rim of potato inside the skin. To do this, I use a melon baller. By the way...this thing comes in really handy for lots of things in the kitchen...and I've never actually used it to ball melons. From there, use your preferred method and recipe for mashed potatoes. As I mentioned back around Thanksgiving in my Garlic Mashed Potatoes post, I am a big fan of using a potato ricer for fluffy mashed potatoes. Normally, I would do roasted garlic and creme fraiche like I did in that recipe, but I decided to skip the garlic this time and use sour cream, because that's what I had on hand. I also added a little buttermilk, butter, and salt and pepper. Feel free to add other things like cheese, chives, bacon, etc. (Mmmmmm....bacon). From there, I piped the mashed potatoes into the skins using a pastry bag and a star tip. This is totally unnecessary. You can totally just spoon them in, but you know how I like to get all fancy sometimes. Brush them with a little melted butter (optional), and pop them back into the oven until warmed through and starting to slightly brown on the edges. While they are baking a second time, make the hash browns. (Is it hash browns or hashed browns? Either way, make your fried potatoes). Start heating some oil on the stove over medium-high heat (you'll need very hot oil). I peeled and shredded my potatoes. To get crispy hash browns, you want to squeeze all of the moisture out of the shredded potatoes. Remember that potato ricer I told you to buy? It works great for this as well. Except instead of pushing them through the holes, you just use it to squeeze all of the water out of the potatoes. Sprinkle potatoes with chives or parsley and top with crispy hash brown rounds. Triple Threat! Speaking of basketball and the tournament, my friend Karen from 365 Days of Slow Cooking is holding a slow cooking tournament. I helped her out with Round 2 of the tournament in the chicken bracket. Continue to check out her site the next couple weeks to see which slow cooker recipe wins the title! Pre-heat oven to 400 degrees. Wash and dry the potatoes. Take 2/3 of the potatoes and drizzle 1 tablespoon oil and toss until well coated. Roast in the oven for 35-40 minutes or until easily pierced with a fork. When cool enough to handle, cut off the top portion of potatoes (or cut them in half). Using a melon baller or spoon, scoop out the potato flesh, leaving a thin wall of potato on the edges. Mash the potatoes using your preferred method/recipe. (I used buttermilk, sour cream, and a little butter). Pipe or spoon into potato skins and brush with a little melted butter. Bake for 20 minutes longer. While potatoes bake, heat the remainder of the oil in a skillet until very hot. Peel and shred the remaining potatoes and squeeze excess moisture out using a potato ricer or paper towels. Drop little piles of shredded potatoes into the hot oil and fry on each side until golden brown, turning once. 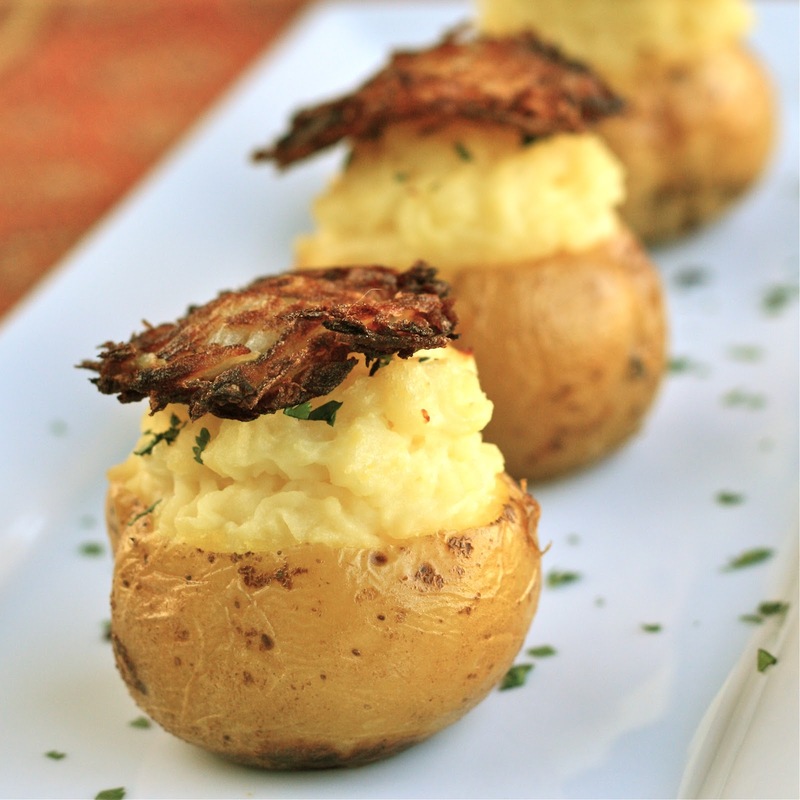 Remove stuffed potatoes from oven and top with hash brown and any additional toppings. Haha....I'm in. Sign me up. Ben's going down. if i were to go on a no-carb diet... I'd cry in front of these! and breads! I was seriously carb-loading today (for no apparent reason). Had these during the day, pasta at night, and then decided to make a loaf of sourdough bread. Those look delicious only hope I can make them look half as edible.